Last year, renewable energy technologies like wind and solar were the fastest growing new sources of electricity in the U.S.  and though the recession has slowed down expansion, green power is still set to take off under President Barack Obama. But if America is ever going to truly run on renewable energy  less than 12% of U.S. electricity currently comes from alternatives sources, and most of that from older types like nuclear and hydro  we'll need to embrace next-generation technologies. When most of us think about solar power, we picture the silicon panels that dot our greener neighbors' roofs, converting the sun's rays directly into electricity. But there's another, simpler type of solar power that uses massive mirrors to focus the heat of the sun, creating steam that can drive electric turbines. 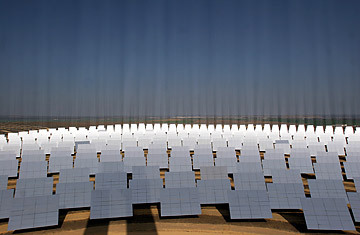 The advantages of concentrated solar power (or solar thermal, as it's also known) is that utilities can build commercial-scale plants that could potentially replace fossil fuel-powered plants for a lot less money than what it would take to install thousands of distributed solar photovoltaic panels. The 354-megawatt (MW) Solar Energy Generating Systems plant in California's Mojave Desert is the largest such solar installation in the world, and last year the Spanish company Acciona built a new 64-MW plant outside Las Vegas. The vast, sun-soaked desert of the American Southwest has tremendous solar thermal potential  by one estimate a single, massive plant 100 miles on each side could supply enough electricity for the entire country. Granted, that's a big patch of land  but it's not much to power a nation.